It’s now the end of May, so the “perceived optimum” planting date for corn and soybeans has passed. Optimum planting date assumes the soil is “fit” for seeding – if the soil is unfit, the optimum planting date lingers until soil conditions are suitable. The extremely wet weather this spring has left soils saturated and delayed planting. So we ask the question: Is it worth it to ram that crop into the ground if you’re doing damage to the field when you plant? What’s a little compaction if it means the crop gets in the ground sooner? Soil is made up of about 45% minerals, 25% air, 25% water and 5% organic matter. When soil gets compacted, the soil particles get squished together and the air space is reduced. Less air space means fewer pores in the soil and higher bulk density. All of these are caused by what goes on at the soil surface, but some are much harder to get rid of. This is not a recipe for a healthy crop, and the results are obvious at harvest time. In good growing conditions, compaction can reduce corn yield between 10-35 bushels per acre. In poor conditions, yield loss can be up to 60%! It may cost a few percent in potential yield if planting is delayed while waiting for soil conditions to improve. But it takes a lot of yield benefit from an earlier planting date to make up for the potential losses caused by compaction! In an average cropping year with a conventional cropping system, 70% or more of the field can be trafficked. Even in a no-till system, up to 50% of the field can be trafficked. That’s a significant amount of the field which is likely to have some compaction. 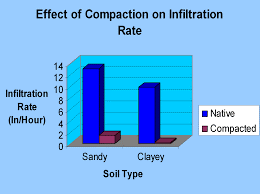 75% to 80% of compaction occurs on the first pass through the field. Driving on the field even once will create problems. Driving a second time on the same track will create some additional compaction, but most of the damage has already been done. So to reduce whole-field compaction, it’s better to drive in an existing track; this is the concept behind Controlled Traffic Farming (CTF). In CTF systems, as little as 15% of the field is trafficked. 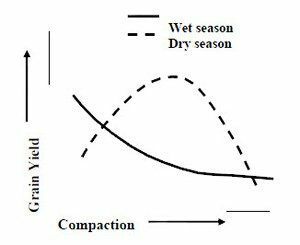 How does soil moisture affect compaction? In good conditions, some compaction can actually be helpful – it promotes good seed-to-soil contact at planting. When conditions are wet, it’s a different story. Wet soils compact much faster and more easily than dry soils – any benefit of seed-to-soil contact is offset by the negative impacts of reduced infiltration, lower aeration, increased denitrification and higher potential for root diseases. Wet soils also compact deeper than dry soils. As the tractor tires sink into the ground, soil at the outside of the tire gets pushed away, and the ground contact area for the tire gets much larger. That might sound like a good thing – BUT because soil has been pushed away, the contact pressure at the edge of the tire is much lower, and the contact pressure in the centre is much higher and more concentrated. This drives compaction deeper in wet soils. How do you know compaction is present? Look for it! 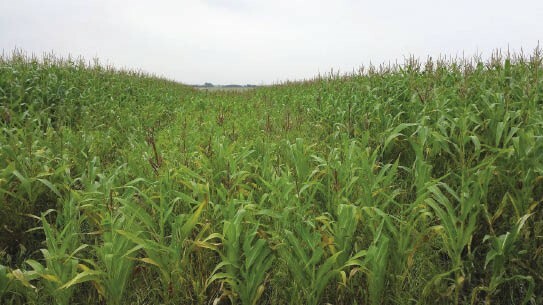 Serious compaction is visible in ruts and tire tracks, stunted plant growth, nutrient deficiency, ponding water, etc. It is visible up close and with overhead imagery. 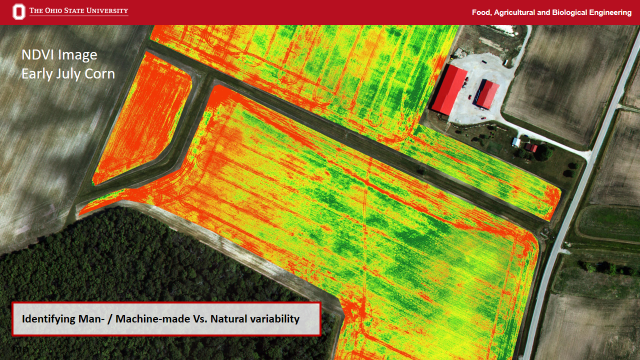 With overhead imagery, especially NDVI growth images, it’s very obvious where the crop is struggling. If the poor zones show a repeated and/or linear pattern, the cause is usually man-made. Nature doesn’t often create straight lines. Feel for it! Use a soil probe. It is much harder to push a probe into compacted soil than into un-compacted soil. 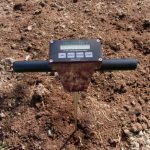 A penetrometer is a soil probe with a pressure gauge on the end – this can tell you the pressure resistance of the soil. High pressure readings on the penetrometer are good indications of compacted areas. Dig for it! The plant roots will show evidence of compaction. 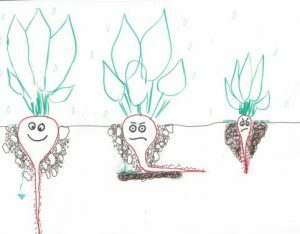 Normally, roots grow in all directions. If roots grow in a flat plane, or stay shallow without much downward growth, there is serious compaction in the soil. How much compaction is my equipment creating? 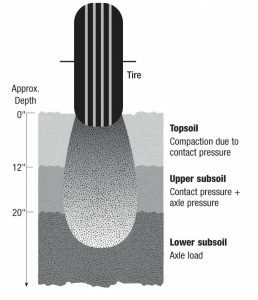 Contact pressure (governed by the number of tires and the tire footprint area) is mainly responsible for surface compaction in the tilled layer (0 to 12 inches down). Sub-surface compaction (12 to 20 inches down) is driven by a combination of contact pressure and axle load. Deep compaction (below 20 inches down) is governed almost completely by axle load (regardless of the number of tires). Surface compaction is mainly influenced by the pressure at the surface. The easiest way to alleviate surface compaction is to use more tires – this increases the total surface contact area, and reduces the pressure on the soil. If duals aren’t an option, use the widest tires possible. Large-diameter tires will also have a larger surface contact area. Tire selection matters. Most agricultural tires today are radials – but bias tires still exist, and on some equipment you might not expect. Don’t use bias tires on high load axles! Radial tires allow more sidewall flex, providing a greater surface contact area. Tire inflation pressure also makes a difference. Lower inflation pressure creates a larger footprint. Reducing inflation pressure can reduce compaction from equipment that carries very heavy loads, Systems exist which can inflate/deflate tires automatically from the cab – a good option for heavy equipment such as manure tankers, sprayers and grain buggies. Using IF (increased flex) or VF (very high flex) tires, if available, will allow even lower inflation pressures which improves surface contact area even more. Tracks are more fuel-efficient than tires – but you can buy a lot of fuel for the added cost of tracks. Tracks are typically better than row-crop tires because of the large surface area. But tracks do not have a constant pressure – the rollers inside the tracks create point loads of higher pressure that are not evenly distributed. So despite having a large track, compaction can still occur. When using tracks, wider is better to reduce compaction. Tire contact pressure is not the whole story. Regardless of the number of tires, axle load will determine how deep the compaction goes. What is the magic number? Axle loads less than 10 tons (9 metric tonnes) will keep most compaction above 20 inches in depth. Higher loads drive the compaction deeper into the subsoil. What about dual tires? Will that reduce the axle load? 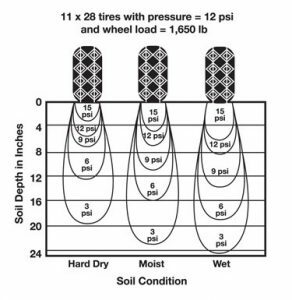 Dual tires are typically close together – so while the contact area is larger (with less contact pressure and lower surface compaction), deep in the soil the pressures from both tires combine and there isn’t much difference between duals or singles. Because 75% to 80% of compaction occurs on the first pass through the field, a second tire (on a second axle) is like a “second pass” through the field. There will be some additional compaction but not as much as the first pass. With duals, the second tire is beside the first tire so the “first pass” is twice as wide. More axles results in a narrower band of compaction. How can I get rid of compaction? In short, you can’t. Surface compaction may be able to be alleviated with some tillage (which can create its own compaction from the shearing effect! ), but tillage will not remove deep compaction. The winter freeze-thaw will help at the surface, but it won’t have any effect on compaction deeper that the top few inches. 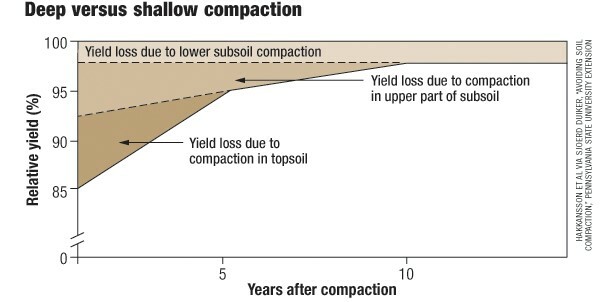 Practices such as applying nutrients in such a way to make them more plant-available can reduce some of the effects of compaction, but won’t alleviate the compaction itself. Subsoiling is not the answer either. In some cases, research studies have actually shown yield decrease from subsoiling. Subsoil machines typically need a lot of pulling power, so you’re creating more compaction when you’re pulling that machine through the field, not to mention the shearing compaction that occurs at the bottom of the teeth. 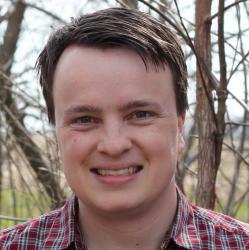 Think of soil compaction like a slice of bread. Take that bread and squish it flat. Now try to fluff it back up again. What tools can you use to fluff it back up? A fork? A knife? A spoon? No matter how much you chop, slice, or work the flattened bread, it will never quite return to its previously fluffy state. It was biological activity (yeast) that made the bread fluffy in the first place. Maybe it takes biological activity in the soil to really un-do the effects of compaction. Biological activity in soils can be increased through practices like no-till or conservation tillage, organics application (manure, compost) and cover cropping. This may provide an answer to mechanical compaction and will help to regenerate the soils – but it will take time. Sometimes the only option is wait for the compaction to be reduced by natural and biological forces. The deeper the compaction and the higher the clay content in the soil, the longer the compaction will persist. Wherever possible, the best option is avoid putting compaction there in the first place. Stay off the field until the soil is ready. 70% or more of a field can be trafficked in a “normal” agricultural system. 75-80% of compaction damage happens on the first pass. Don’t put the compaction there in the first place!